Learn in the classroom and on the go. Thinner than its predecessor, these devices are built to withstand the rigors of active students with shock-absorbing molded rubber trim, a reinforced power port, Corning® Gorilla® Glass 3, and a spill-resistant keyboard. Stay on task in the classroom or in the cloud. Power through the school day with the latest Intel® processors and battery life up to 16 hours.1 Get reliable wireless connectivity from 2x2 AC wireless or use the RJ-45 to access stable wired network. Integrated HP manageability and security software tools such as HP Manageability Integration Kit to manage systems across the OS and HP BIOSphere Gen4 for automatic BIOS updates, protect the school’s network and student data. Durability for the school day ahead. Deploy this durable device into any school day. It has a strong 180° hinge and is designed to pass a 70 cm drop on concrete and MIL-STD 810G and IP 41 testing. Reliable performance for education. Tackle school and beyond with the latest Intel processors and long battery life. See and collaborate clearly with an optional 11.6” diagonal touchscreen, VGA webcam, and stereo sound. Connect in large spaces with integrated 2x2 WLAN and MIMO. Flexibility and manageability. Enhance student learning with HP School Pack 3.5 digital content and support for Windows applications like Office 365. Work in the cloud or local with up to a 128 GB eMMC and a micro SD card slot. Simplify management with Intune for Education. HP School Pack 3.5 is an education suite of applications and access-from-anywhere, cloud-based services that empowers teaches, removes digital distractions, and unlocks student potential. This education software suite has helped millions of students and teachers make the most of technology in the classroom. HP Classroom Manager 4.0 helps keep students focused and engaged, reduce digital distractions and increase instruction time. HP Simple Sign On created by ClassLink provides access thousands of education applications and services in school and at home with any easy one-click single sign-on. bulb Digital Portfolios allows students to protect and share digital projects through an easy to use, secure platform that grows with student as they progress through their education. The HP ProBook x360 11 G3 EE is expected to be available January 2019. The HP ProBook x360 11 G4 EE is expected to be available Spring 2019. 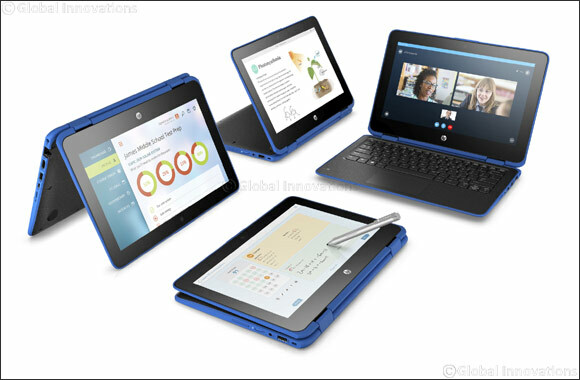 The HP Stream 11 Pro G5 is expected to be available December 2018. The starting price for HP ProBook x360 11 G3 EE & HP ProBook x360 11 G4 EE will be $430. The starting price for HP Stream 11 Pro G5 will be $390.